New York University is a private university based in New York City that was founded in 1831. Its total undergraduate enrollment is 26,135. The university is ranked as the #30 best national university according to US News and World Report for 2018. The Leonard N. Stern School of Business is ranked the #13 best business school in the country according to US News. Some Stern MBA alumni have risen to the top of their respective fields, such as Jack Abernethy, CEO of Fox Television Stations, and John Dempsey, group president of the Estee Lauder Companies. New York University overall accepts only 32% of those who apply, making it a very selective institution. Colleges with a low acceptance rate tend to have higher quality and provide a higher quality education than less selective universities. The MBA program also is selective with only a 21% admission rate. There most recently were 3927 applicants and 822 admitted. Accreditation is a very important part of earning your MBA. It is important that your MBA comes from an accredited institution. NYU Stern’s MBA programs are accredited by the AACSB. This is one of the most respected business education accreditation agencies in the world. Your degree will be respected as one of high quality from potential employers with the AACSB seal of approval. NYU Stern offers a part time and full time MBA, as well as an executive MBA for highly experienced professionals. If you have special interest in technology, you also will feel at home with Stern’s Tech MBA. This MBA has coursework in emerging technologies, dealing with data, devOps and software engineering and technical product management. This is a one year program. There also is a fashion and luxury MBA for professionals in the fashion and retail industry. The four year graduation rate for NYU is very high at 82%. This indicates that most students graduate on a timely basis and enter the working world. Students who take five or six years to graduate or more spend more money being in school. It is generally better to graduate from college in four years or even sooner if possible. The business school at NYU is ranked highly – it is currently ranked #14 according to US News and World Report. It also is located in the heart of New York City, so there are many professional and cultural advantages to attending a program that is in the middle of one of the financial centers of the world. 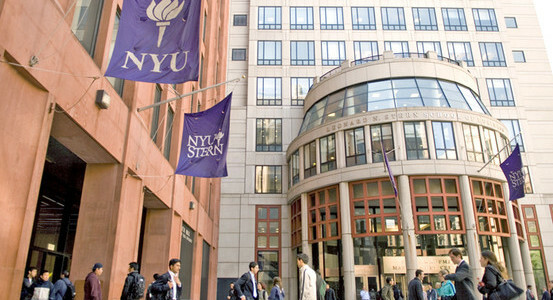 US News and World Report states the average base salary for MBA graduates of Stern is $121,100, which is excellent. This does not include sign on bonuses and other compensation such as year end bonuses. Also, 80% of graduates of the part time and full time MBA program are employed when they graduate. NYU Stern still requires applicants to take either standardized test, and the college website does not mention any waiver policy for experienced professionals. However, the site states there is no minimum score required to be considered for admission. It appears that the GMAT or GRE test results are just one component of your overall application that Stern considers. NYU Stern offers many attractive MBA options, including a full time, part time, tech and fashion and luxury MBA. But there is no online MBA offered at this time. Many students may like having a campus right in the middle of Manhattan, but going to graduate school in the heart of New York City is not for everyone. There is no real ‘campus’ in a traditional sense; the university’s buildings are spread around several city blocks.